Kerry “Keep Punching” Daigle is one of Professional Boxing’s true heavyweights – an undisputed master promoter, trainer , manager, agent and internationally-acclaimed champion of the sport. With nearly 40 years of insider-only experience at the highest levels, Daigle’s degree as an exacting chemist of the sweet science has been hard-earned working his way around every area of Professional Boxing. He has learned the ropes inside and out from some the game’s most elite professionals across the globe since 1971. David lives in Marksville, LA and has four children: David Rivas III; Dakota Christian; Dawson Luke; and Isa Bella Jolie. He began his career with the Tunica-Biloxi Tribe as an Inspector with the Gaming Commission in 1995. He was later promoted to Investigator and served in that capacity until 1999, at which time he was appointed as the Tribe’s Director of Political Affairs. David has worked with Keeppunching Entertainment in assisting many nationally televised boxing matches. Dr. Charles Campbell is a board-certified ophthalmologist specializing in vitreoretinal surgery. He is a member of the American College of Surgeons, International College of Surgeons, American Society of Retina Specialists, Macula Society, Texas Society of Ophthalmology and Otolaryngology, Texas Ophthalmological Association, Nueces County Medical Society, Texas Medical Association, American Medical Association, International Eye Foundation, and American Society of Contemporary Ophthalmology. Dr. Campbell also manages professional boxers and handles medical and nutritional needs for staff and fighters with Keeppunching Entertainment. Angela serves as the Vice President of Operations for Keeppunching Entertainment. She has assisted in producing numerous nationally televised events. Angela graduated from Louisiana State University in 2016 and currently resides in Los Angeles, California, where she also works in the fashion merchandising industry. Christopher has handled marketing and promotions for Keeppunching Entertainment since 2013. 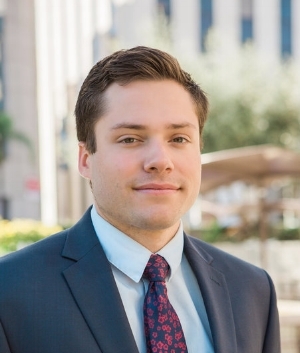 In addition to assisting with the branding and promoting of Keeppunching, Christopher is also a licensed real estate professional in California and Louisiana. Christopher graduated from Louisiana State University in 2015 with a degree in Business Marketing. While attending LSU, Christopher served two terms as the President of the Student Real Estate Association and the Director of Membership Development for Pi Sigma Epsilon. He was also a member of the Collegiate Entrepreneurship Organization of LSU and the LSU Student Incubator.